Mr. Nashville: Twang's The Thang At Obama's White House Country Celebration! Twang's The Thang At Obama's White House Country Celebration! If wishes were horses beggars would ride, right? Well, I'm sure a lot of country music fans would like to have a private, star studded, Country Music performance in their home. I know one family who did. The First Family to be exact. Yesiree, President and First Lady Obama celebrated "The History Of Country Music" with performances by Lyle Lovett, Kris Kristofferson, and Darius Rucker. The concert will air on PBS at a later time. 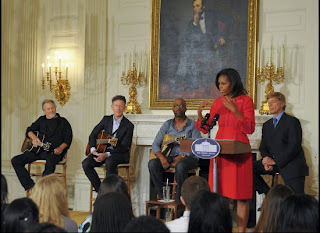 This isn't the first time The Obamas have welcomed Country Music to the Executive Mansion. In 2009, Alison Krause, Charley Pride, and Brad Paisley served up some twang for a similar event. "Country music can be about love. It can be about heartache. It can sing sad times, or it can yell out that I'm just here having a good time." The President said. President and First Lady Obama should let me plan the next Country Music event for them! Better yet, the President should attend a performance of the Grand Ole Opry. If he makes that trip to Nashville we can overlook the fact that he didn't come see during our tragic flood of 2010. Your first entries are really hard to read on this, it's hard to read the entries when there is text on the photos behind you, is there a way to fix that so it's easy to read? Obamas need to see the Opry. And yes, we might overlook the fact that he was golfing instead of visiting Nashville during a flood.